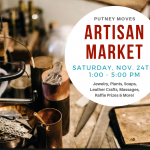 First Ever Artisan Market at Putney Moves! Please join us this Saturday for our first ever Artisan Market showcasing local artisans and crafters! In an attempt to support small businesses and local artists we are transforming our yoga studio into an indoor market stocked with jewelry, leather goods, soaps, plants, 10 minute massages, gently loved yoga gear, our new apparel line, and other great holiday gifts! Raffle prize to include two yoga blocks, a new tank top and yoga mat! We are so excited to share this time off the mat with you and to give our community members an opportunity to showcase their passions! The Putney General Store has launched a new website to highlight the range of products and events it offers area residents and visitors to the Putney area. The new site is at: www.putneygeneralstore.com. The Westminster West School invites you to its annual (and much anticipated!) spring plant sale, on Saturday, May 23 from 9am – 1pm. Come early for the best selection, including a wide variety of annuals, perennials, and vegetable starts from some of the area’s finest gardeners and farmers. Putney Cares Inc and the NeighborWorks H.E.A.T Squad to host a Home Energy Audit Open House on June 28, 2:00 p.m. to 5:00 p.m. at 54 Kimball Hill Rd Putney VT.
Come learn about home energy audits, Solarize Putney, and cold climate heat pumps and hybrid heat pump water heaters so you can save money and be more comfortable all year round. Mike Raymond, VT Home Performance with ENERGY STAR auditor, will walk us through an energy audit of the Activities Barn including live blower door testing and infra-red imaging. He will also discuss how homeowners can save money and be healthier and more comfortable once improvements are made. PUTNEY, V.T. – (March 25, 2014) Putney based SunFarm Community Solar in conjunction with Vermont’s largest utility, Green Mountain Power (GMP), and the nation’s leading community solar developer, Clean Energy Collective (CEC), are brining a community-owned solar array to residents in the Brattleboro area. It is the second in a progression of community solar facilities planned for Vermont, making community solar available to some 70 percent of the state’s electricity customers. During this three-day retreat, allow yourself to experience simple and profound ways to awaken your body’s innate healing ability. Learn general principles in health and vitality (how we nourish it and how it gets blocked.) Engage in simple, active exercises to help transform and revitalize your energy. Experience relaxing guided meditations to open your heart and deepen your capacity for more peace. Thomas Garbarino, M.Ac., Dipl.Ac. (NCCAOM) is a certified practitioner of Classical Chinese Medicine and Acupuncture, Chinese Herbal Medicine, Chinese Dietary Therapy, and Medical Qigong (energetic healing). He also teaches Daoist and Buddhist Qigong meditation and classical Yang Family Taiji Quan (Tai Chi Chuan). Come ride this weekend to support the Putney Foodshelf. This time of year all of the folks at the Putney Foodshelf can use our help as they try to make sure everyone is well provided for during the holiday season. They will be upping their efforts over the next few weeks to see that no one in need. On Sautrday 14th and Sunday 15th, Hot Wheelz Cycle Studio is hoping to fill the house, not only with riders, but with some great donations of food items as well. The foodshelf is in need of a variety of non-perishable items, such as healthy canned goods. A general rule of thumb is to try to donate only sutff that you would eat yourself and that isn’t out of date. Photo taken from the Exit 4 Sunoco station. The Apron Theater Company and the Next Stage Arts Project, 15 Kimball Hill, Putney, VT present Margaret Edson’s Pulitzer Prize winning play, Wit, directed by Hallie Flower. Wit will run July 18th thru July 20th. Performances are at 8 pm. Tickets are $10.00, general admission. Reservations: 802-387-0071.Tickets: online at www.nextstagearts.org. Wit marks The Apron Theater Company’s return to the local theater scene and its first production as the Next Stage Arts Project’s “theater-company-in-residence.” The play has received rave reviews by audiences and critics alike. There are a couple of spots open in Escuelita Spanish School’s Spanish camp this summer. At Spanish Camp, children acquire Spanish through songs, movement, games, and stories. Part of the day is structured Spanish time where children are able to hear 100% comprehensible Spanish in a way that maximizes acquisition. At other times, we play games, make art, cook, and explore the stream, forest, and gardens around us incorporating Spanish into all activities. Dan Foster first tested positive for Lyme disease 22 years ago. This talk (a repeat of his June 18th talk, due to popular demand!) is about Dan’s odyssey with a super bacteria that he believes he will soon be rid of. Though he was treated promptly after his tick bite bull’s eye rash, he has had a variety of symptoms over the last 20+ years, but was able to manage them all pretty well until last year. Putney, VT – Next Stage Arts Project, in collaboration with Strong Coffee Stage, is pleased to present PUTNEY VAUDEVILLE on Friday, May 24, 2013, at 7:30pm at Next Stage, 15 Kimball Hill, Putney, VT. General Admission tickets are $12 / $6 for children under 12, and are available at www.nextstagearts.org and Offerings in Putney. For more information, contact Next Stage Arts at (802) 387-0102 or nextstagearts@gmail.com. PUTNEY VAUDEVILLE is the creation of Rebecca Waxman, Bronwyn Sims, Patrick Donnelly and Peter Siegel who hope to launch an ongoing showcase for old time entertainment and community talent. The night will include a stellar professional act, a rousing live band, assorted friends and neighbors displaying skills you may never have seen, beer and wine service and good-natured audience engagement. 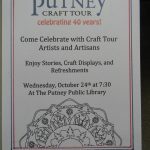 Putney Library: 55 Main St.
For more info call 387-4407.